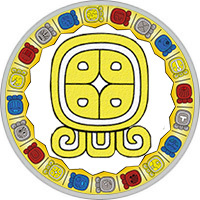 Mayan Name: Q´ANIL / Lamat. Compatibility: Star, Road, Vulture, Sun, Lizard. Mayan Star sign (Lamat) — abundance, maturation. The meaning of the sign is the star, the patron is the Moon Goddess Ichkhel, the totem animal is a rabbit. The Star sign is associated with Venus, symbolizing the continuous cycle of death and rebirth. Ancient Maya was considered the personification of Venus by the ugly God of Lakhunchan, which generates panic and chaos in a drunken frenzy. His intoxication was associated with the image of Rabbit, whom the Maya associated with the Moon. It was believed that Rabbit has the talent to create, multiply life’s goods, he is a symbol of abundance. From here comes the second name of the sign — Rabbit, the Moon. The star symbolizes the process of maturation, the successful completion of all started cases. Fate awarded the Star sign people the talent to bypass the difficulties and failures that invariably arise on the path of life. Hard-working, active people do not tolerate idleness, do not sit idly by, relying on their luck in everything. They work a lot, they are in constant movement. The person of the Star sign is a practitioner: clearly defines not only the goal, but also the shortest path to it. It does not complicate to itself and to surrounding people a life by extensive reflections and eccentric ideas. Independence, independence, perseverance, diligence are qualities that guarantee life success. People of this sign live a life of prosperity and tranquility. Practical people of the Star sign prefer to deal with a particular matter. Quietly solve the most difficult tasks: for a second they do not admit the idea that an undertaking can turn into a failure. They try to provide themselves and their families with decent living conditions, so they work hard. Material wealth — not only a component of comfort, but also an occasion for pride. They experience the joy of the results of labor, it is important for them to feel their indispensability and superiority. They aspire to occupy managerial positions, most of all people of this sign are attracted by the sphere of finance. In a romantic relationship, the representative of the Star sign looks for bright emotions, unforgettable sensations. He tries to avoid the society of boring, boring people who are suffocating with their care and attention. Life is a fun adventure that gives joy: why suffer and suffer? Freedom-loving nature does not hurry to bind oneself by marriage. But if a man of the Star sign fell in love, instantly becomes a sensitive and caring partner. Madly loves their children, doing everything possible and even impossible for their happiness. The man of the Star sign carefully follows his appearance: he is always neatly combed and dressed with taste. He is the object of adoring women, the object of hunting. Has a sharp mind, a wonderful memory, despite its straightforwardness, will find a way around the embarrassing situation. Therefore, it is considered a good interlocutor with whom to have a good time. But in a critical situation, his ostentatious complacency instantly gives way to concentration and concentration. First of all, he is a businessman, everything else is completely unimportant. A touching, sensitive woman of the Star sign needs a strong partner. If desired, she can build a successful career, but seeks to create a strong family. In dreams, she sees herself as the mother of a pile of kiddies, a real keeper of the hearth. She has culinary talent, she cooks a lot and deliciously. With maximum benefit uses its natural abilities: the house — a full bowl, the garden amazes imagination with fragrant flowers and outlandish plants. A modest woman rejoices at the happiness of her close people, fully devotes herself to their interests. But do not forget about its practical approach to life: at the very beginning of family relations it is she who first will get a speech about the marriage contract.